ComplexDataReader reads non-homogeneous data and sends records to the corresponding output edge(s). The component uses a concept of states and transitions and optional lookahead (selector). The user-defined states and their transitions impose the order of metadata used for parsing the file - presumably following the file's structure. For port reading. See Reading from Input Port. One field (byte, cbyte, string). ComplexDataReader does not propagate metadata. 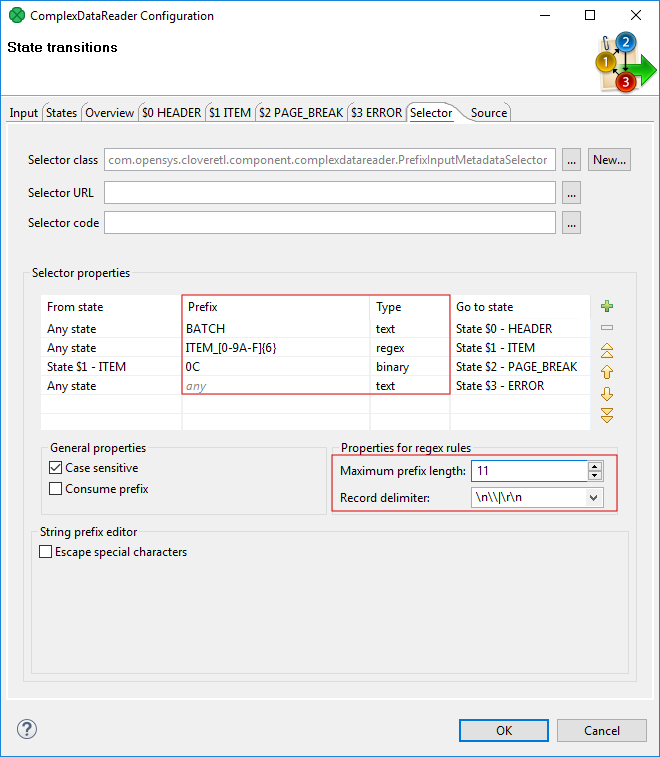 ComplexDataReader does not have any metadata template. Metadata on output ports may differ. The component usually has different metadata on its output ports. Metadata on output ports can use Autofilling Functions. The source_timestamp and source_size functions work only if records are read from a file directly. If the file is an archive or it is stored in a remote location, the timestamp will be empty and the size will be 0. 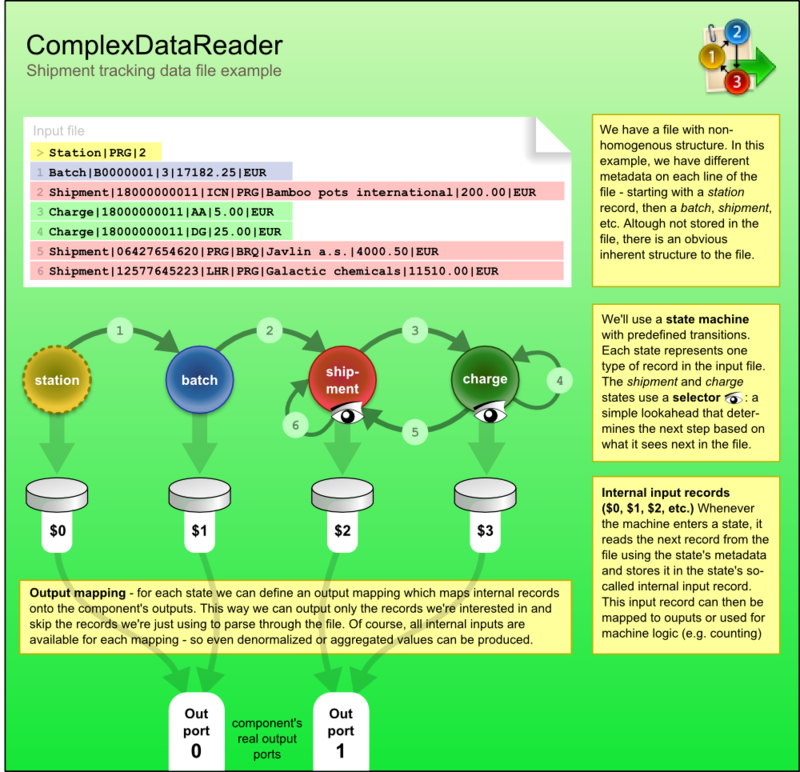 The data source(s) which ComplexDataReader should read from. The source can be a flat file, an input port or a dictionary. See Supported File URL Formats for Readers. The definition of the state machine that carries out the reading. The settings dialog opens in a separate window that is described in Details. The encoding of records that are read. The default encoding depends on DEFAULT_SOURCE_CODE_CHARSET in defaultProperties. Determines steps that are done when an error occurs. For details, see Data Policy. Unlike other Readers, Controlled Data Policy is not implemented. Lenient allows you to skip redundant columns in metadata with a record delimiter (but not incorrect lines). Lenient data policy cannot be used to skip invalid records. Specifies whether leading and trailing whitespaces should be removed from strings before inserting them to data fields. See Trimming Data. Fields containing a special character (comma, newline or double quote) have to be enclosed in quotes. Only single/double quote is accepted as the quote character. If true, special characters are removed when read by the component (they are not treated as delimiters). Example: To read input data "25"|"John", switch Quoted strings to true and set Quote character to ". This will produce two fields: 25|John. By default, the value of this attribute is inherited from metadata on output port 0. See also Record Details. Specifies which kind of quotes will be permitted in Quoted strings. By default, the value of this attribute is inherited from metadata on output port 0. See also Record Details. Specifies whether leading whitespace characters (spaces, etc.) will be skipped before inserting input strings to data fields. If set to default, the value of Trim strings is used. See Trimming Data. Specifies whether trailing whitespace characters (spaces, etc.) will be skipped before inserting input strings to data fields. If set to default, the value of Trim strings is used. See Trimming Data. The maximum number of tolerated error records on the input. The attribute is applicable only if Controlled Data Policy is being used. If a field is delimited by a multiplied delimiter character, it will be interpreted as a single delimiter if this attribute is true. By default, a simple error notification is provided, with higher performance. If switched to true, a detailed error notification is provided, with lower performance. If you decide to use a selector, you can write its code in Java here. A selector is only an optional feature in the transformation. It supports decision-making when you need to look ahead at the data file. See Selector. The name and path to an external file containing a selector code written in Java. To learn more about the Selector, see Details. The name of an external class containing the Selector. To learn more about the Selector, see Details. Transform URL The path to an external file which defines state transitions in the state machine. Transform class The name of a Java class that defines state transitions in the state machine. Selector properties Allows you to instantly edit the current Selector in the State transitions window. State metadata Allows you to instantly edit the metadata and states assigned to them in the State transitions window. If you do not define any of these three attributes, the default Selector class (PrefixInputMetadataSelector) will be used. ComplexDataReader uses principle of the state machine to read the input record and to send data to the correct output port. The data may mix various data formats, delimiters, fields and record types. On top of that, records and their semantics can be dependent on each other. For example, a record of a type address can mean a person's address if the preceding record is a person, or company's address if the address follows the company record. MultiLevelReader and ComplexDataReader are very similar components in terms of what they can achieve. In MultiLevelReader, you needed to program the whole logic as a Java transform (in the form of AbstractMultiLevelSelector extension); while in ComplexDataReader, even the trickiest data structures can be configured using the GUI. Transitions between states can either be given explicitly - for example, state 3 always follows 2, computed in CTL - for example, by counting the number of entries in a group, or you can consult the helping tool to choose the transition. The tool is called Selector and it can	be understood as a magnifying glass that looks ahead at the upcoming data without actually parsing it. You can either custom-implement the selector in Java or just use the default one. The default selector uses a table of prefixes and their corresponding transitions. Once it encounters a particular prefix it evaluates all transitions and returns the first matching target state. Reset counter - resets a counter which stores the number of times the state has been accessed. Reset record - resets the number of records located in internal storage, ensuring that various data read do not mix with each other. Next, Parsing of the input data is done. This reads a record in from the file and stores it in the state's internal input. After that comes Output which involves mapping the internal inputs to the component's output ports. This is the only step in which data is sent out of the component. Finally, there is Transition which defines how the machine changes to the next state. To start designing the machine, edit the Transform attribute. A new window opens offering these tabs: States, Overview, Selector, Source and other tabs representing states labeled $stateNo stateLabel, e.g. "$0 myFirstState". On the left side of the States tab, you can see a pane with all the Available metadata your graph works with. In this tab, you design new states by dragging metadata to the States pane on the right. At the bottom, you can set the Initial state (the first state) and the Final state (the machine switches to it shortly before terminating its execution or if you call Flush and finish). 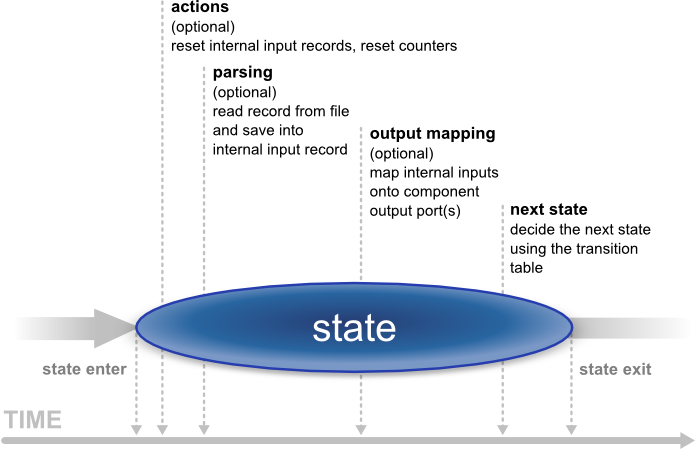 The final state can serve mapping data to the output before the automaton terminates (useful for treating the last records of your input). Finally, in the center there is the Expression editor pane, which supports Ctrl+Space content assist and lets you directly edit the code. In the Overview tab, the machine is graphically visualized. Here you can Export Image to an external file or Cycle View Modes to see other graphical representations of the same machine. If you click Undock, the whole view will open in a separate window that is regularly refreshed. A particular state the machine changes to. The Selector tab allows you to implement your own selector or supply it in an external file/Java class. Finally, the Source tab shows the code the machine performs. For more information, see CTL in ComplexDataReader. you can write its code in CTL inside the GUI by switching to the Source tab in Transform, where you can see the source code the machine performs. You do not have to handle the source code at all. The machine can be configured entirely in the other graphical tabs of this window. Changes made in Source take effect in remaining tabs if you click Refresh states. If you want to synchronize the source code with states configuration, click Refresh source. There are the counterStateNo variables which store the number of times a state has been accessed. There is one such variable for each state and their numbering starts with 0. So for example, counter2 stores how many times state $2 was accessed. The counter can be reset in Actions. integer initialState() - determines which state of the automaton is the first one initiated. If you return ALL, it means Let selector decide, i.e. it passes the current state to the selector that determines which state will be next (if it cannot do that, the machine fails). integer finalState(integer lastState) - specifies the last state of the automaton. If you return STOP, it means the final state is not defined. integer nextState_stateNo() returns a number saying which state follows the current state (stateNo). If you return ALL, it means Let selector decide. If you return STOP, it means Flush and finish. nextOutput_stateNo(integer seq) - the main output function for a particular state (stateNo). It calls the individual nextOutput_stateNo_seq() service functions according to the value of seq. The seq is a counter which stores how many times the nextOutput_stateNo function has been called so far. At last, it calls nextOutput_stateNo_default(integer seq) which typically returns STOP meaning everything has been sent to the output and the automaton can change to the next state. integer nextOutput_stateNo_seq() - maps data to output ports. In particular, the function can look like, for example, integer nextOutput_1_0() meaning it defines mapping for state $1 and seq equal to 0 (i.e. this is the first time the function has been called). The function returns a number. The number says which port has been served by this function. integer nextOutput(integer state, integer seq) - calls individual nextOutput() functions according to the current state and the value of seq. By default, the selector takes the initial part of the data being read (a prefix) to decide about the next state of the state machine. This is implemented as PrefixInputMetadataSelector. a specification of Prefix and its Type. A prefix may be specified as a plain text, a sequence of bytes written in hexadecimal code, or using a regular expression. These are the Types of the rules. The prefix can be empty meaning the rule will be always applied no matter the input. As the selector is invoked, it goes through the list of rules (top to bottom) and searches for the first applicable rule. If successful, the automaton switches to the target state of the selected rule. If rules are defined in this exact order, the latter will never be applied because the regular expression also matches the first five letters of "APATHY". Because some regular expressions can match sequences of characters of arbitrary length, two new attributes were introduced to prevent PrefixInputMetadataSelector from reading the whole input. These attributes are optional, but it is strongly recommended to use at least one of them; otherwise, the selector always reads the whole input whenever there is a rule with a regular expression. The two attributes: Maximum prefix length and Record delimiter. When matching regular expressions, the selector reads ahead at most Maximum prefix length of characters (0 meaning "unlimited"). The reading is also terminated if a Record delimiter is encountered. Lenient data policy cannot be used to skip invalid records. Reading Different Records from Single File. Three programs log actions to one logging facility and the facility produces a single file. Each program uses different log format. Categorize lines of a log file for further processing. Use File URL to define source file name(s). Open dialog in the Transforms attribute. On the States tab, add three states with corresponding metadata. You can either add states using the plus button and subsequently add metadata from the combo box, or you can drag metadata from metadata pane onto pane with fields. Switch to the Selector tab. Set up Maximum prefix length to 2. Add states using the plus button and fill in the Prefix and Go to state columns in the tab: A1 for state $0, A2 for state $1 and A3 for state $2. Define the mapping on tabs with particular states: on $0 map record with metadata for A1, on $1 map record with metadata for A2 and on $2 map record with metadata for A3. The following records will be sent to particular output ports. See data from previous example. There is an unnecessary field in output produced in the last example. Process the same file, but remove prefixes A1, A2 and A3 from the result. On the selector tab, set prefix to "A1|", "A2|" and "A3|" and check Consume prefix checkbox. Note: you need to modify metadata. Input file contains records about shipments. Data of one shipment occupies one line. Each shipment has identifier (11 chars), source (7) and destination (7). One shipment consists of zero or more pieces. Each piece is described by a record having header (4) beginning with 300B, piece identifier (3) and description (7). There can be zero or more charges related to the shipment or particular pieces. Each charge consists of header (4) beginning with 400B, piece identifier in the case of charge related to the piece (3), amount (7) and description (27). Pieces and charges are on the same line with shipment. Parse records, each type of record should be passed to a different output port. Input file contains fixed-length data. As a result we need fixed-length metadata. Create fixed-length metadata Shipment, Piece and Charge. All these fixed-length metadata must have empty record delimiter. Create auxiliary delimited metadata Aux with one string field. This will be used to read line ends. Use File URL and Transform attributes. On States tab, create states $0 with Shipment metadata, $1 with Piece metadata, $2 with Charge metadata and $3 with Aux metadata. Set up output mapping of particular states: produce output on port 0 in state $0, on port 1 in state $1 and on port 2 in state $2. Do not produce any output in state $3. Records read by ComplexDataReader in the previous steps have lost mutual binding. It is impossible to track which charges or pieces are connected to which shipment. Add identifier from Shipment record to other records. The solution is built on the solution from previous example. Add the identifier field to Piece and to Charge metadata. On tab $1, add mapping of identifier from Shipment to the identifier in Piece. Do the same of $2 tab with Charge. We recommend users to explicitly specify encoding of input file (with the Charset attribute). It ensures better portability of the graph across systems with different default encoding. The recommended encoding is UTF-8.